I really enjoy using this upper body workout bar. It is so easy to put in place at a doorway and start doing chin-ups. I feel that I am gaining more muscle in my arms and back, and I can definitely feel the burn. This product is very sturdy, I never worry about lifting my full weight on to the bar. It is also easy to take down and store. I would definitely recommend this to anyone that is trying to build muscle mass, or in strength training or general fitness. Wow! It's better than I thought! 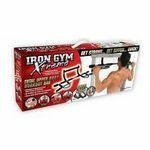 My husband bought the Iron Gym Xtreme Total Upper Body Workout Bar because he was determined to get fit. This decision originated from my sudden desire to get in shape, and he followed suite. Unfortunately, he never even unpacked this bar from the box, so six months later I decided to pull it out and set it up. I was surprised at how challenging it is to use, but also at how effective it was. The following day after I used this bar, my muscles were sore, and after two weeks my friends began to ask what I was doing for my upper body, and complimented my arms. I love how easy it is to fit in to my schedule, and how it doesn't take up practically any space. I would highly recommend this bar, you can fit your upper body workout in even if you only have five minutes! I have the Iron Gym upper body total workout bar, and while I was able to do pull-ups on it, I always thought in the back of my mind it was not going to be sturdy enough. It did slip one day on me while I was struggling to get two extra reps in my set. Luckily I landed on my feet, but I have stopped using it since. Performance It was effective in giving you a good pull-up workout. Ease of Use It was easy to use since I was already familiar with pull-ups. Durability It seems like it can handle a lot of workouts for the price that it costs. Design The design itself is a good concept. However, it is not compatible with a lot of doorways. You can and may fall since the bar will fall off. Workout "machine" for your home. I would highly recommend this product to anyone looking to workout their upper body strength, but don't have enough time to go to the gym. I will warn that this workout bar is only meant for upper body workouts; leaving the buyer with no means of working out their lower body's strength. Performance This product performs extremely well. With a metal pull-up bar, there is a bit of shakiness when performing a pull-up. If in the correct-sized door frame, you will not experience any insecure shakiness when performing a correct pull-up. Ease of Use Anyone will easily be able to pick this workout bar up, and install it correctly on the door frame. The only negative aspect is that the person has to be tall enough to reach the top of the door frame. Durability I have had my workout bar for almost three years and it is still functioning at its full capacity. Not only can you put at the top of your door frame; you can also put it face-down, and perform push-ups. If you correctly place the workout bar at the bottom of your door frame, you will be able to do sit-ups and crunches. The pull up and its variations are some of the best upper body workouts you can do to increase muscle size and resistance strength. The iron gym pull up bar allows you to perform these tasks whenever it is convenient and in whatever doorway your choose. Definitely great for the pad. This product is great for athletes of all types. There are a ton of different workouts you can do with this bar. It's great for your arms, chest, and back. Whether you do pull ups or chin ups you will get a great workout. The worst part of this piece of equipment is that it can leave marks on your door frame. Also if your door frame is not sturdy enough this tool will not work well. Performance This piece of equipment is great for a good workout. Even though it is just a bar there are many different workouts you can do with it. This tool will perform well, but the door frame will affect how it works. If it is not secured properly than it can cause injuries. Ease of Use This is a very easy piece of equipment to use. All you need is a door frame to use it. Durability This bar is very durable and will last for a long time. It may however leave marks on your door frame. Design This is a very simple design. It is easy to disassemble and store it somewhere out of sight. One of the cheapest and best home gym equipment out there. 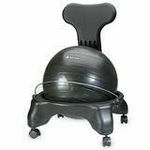 Probably one of the cheapest and best home gym equipment out there. Great for a quick chest and back workout before going to work. The foam grips ripped within the 3 months of usage. Put two cloths on each backside of the bar so the door lintel doesn't get marks. Besides that, it's pretty good. Definite buy for anybody looking for a good upper body workout. The functionality of this product can easily be seen just by looking at a photo of it. Instead of having to look for a sturdy enough bar in my house to support my weight and attempt to to a pull up, I can just hang this up in any doorframe in my house. The bar fits around any doorframe and can support any weight, its simple physics and static equilibrium. The results of this product can be seen almost immediately (as long as you actually use it and dont let it just sit there). I am currently a sophomore in college and it fits great in the doorframe of my closet and doesnt take up any room. I would recommend this product to anyone who is committed to becoming physically stronger and healthier, because its always easier when the equipment is right in your house! I love my iron gym. It makes doing pull-ups, push-ups, and situps really easy. You don't have to have a pullup bar connected to the wall with screws or anything that is always in the way because with this you can just put it over the door frame and take it down when you are done and put it in a closet or wherever. it is really convenient and easy to use and store. It works great for pullups and it gives you different grips so you can work different muscles when you do it. 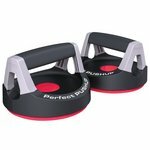 It also has different grips for pushups so you can do wide pushups, or military pushups. 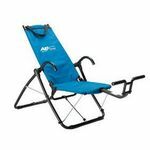 And what I also love is that you can even do situps and dips with it. So you can work your entire upper body with these great little machine and it will definitely make you noticeably stronger if you use it and stick with it.